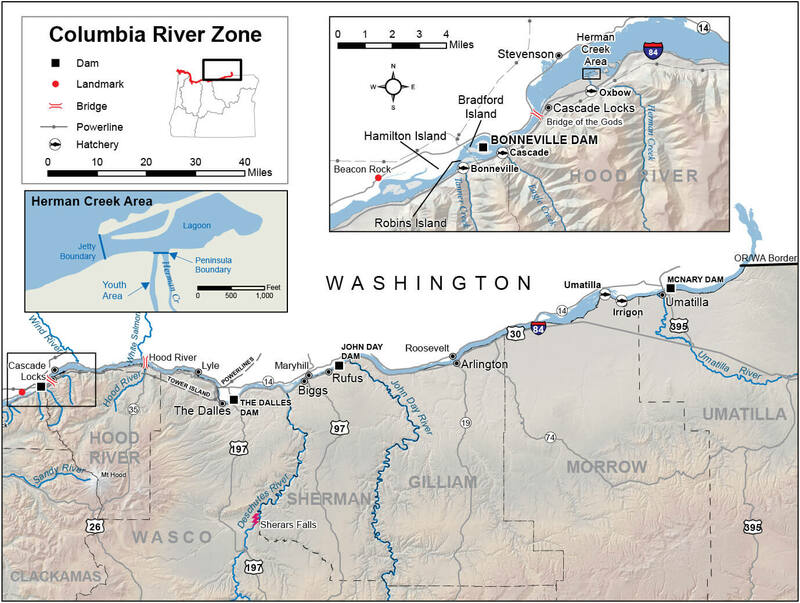 The Columbia River Zone is all waters of the Columbia River upstream from a north-south line through Buoy 10 at the river mouth and includes those portions of tributaries (including lakes) downstream from the mainline railroad bridges near the tributaries’ mouths except for the Willamette (including Multnomah Channel), Sandy, Hood, Deschutes and Umatilla river systems, Skipanon River, and Youngs Bay. 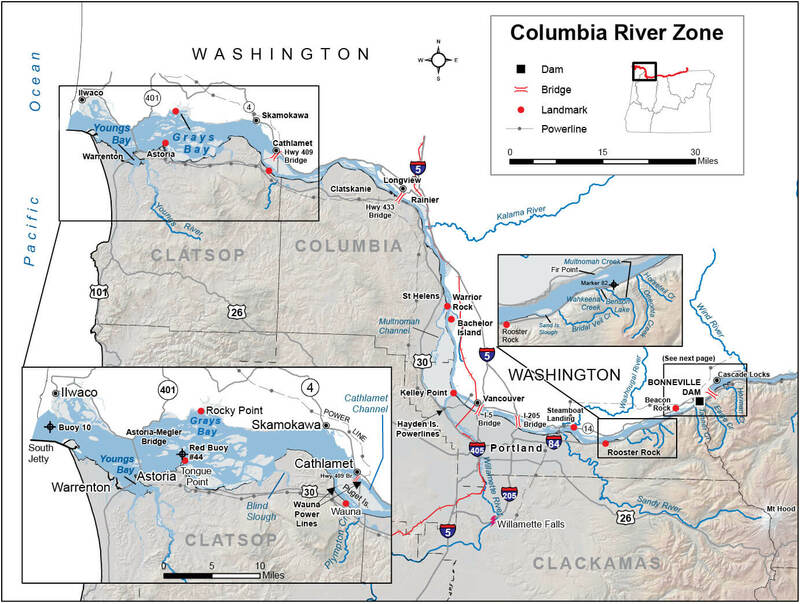 The Columbia River Zone includes downstream from Hwy 730 on the Umatilla River and from Interstate 84 on the Deschutes River, and the lower Skipanon River downstream of the Harbor Street Bridge. 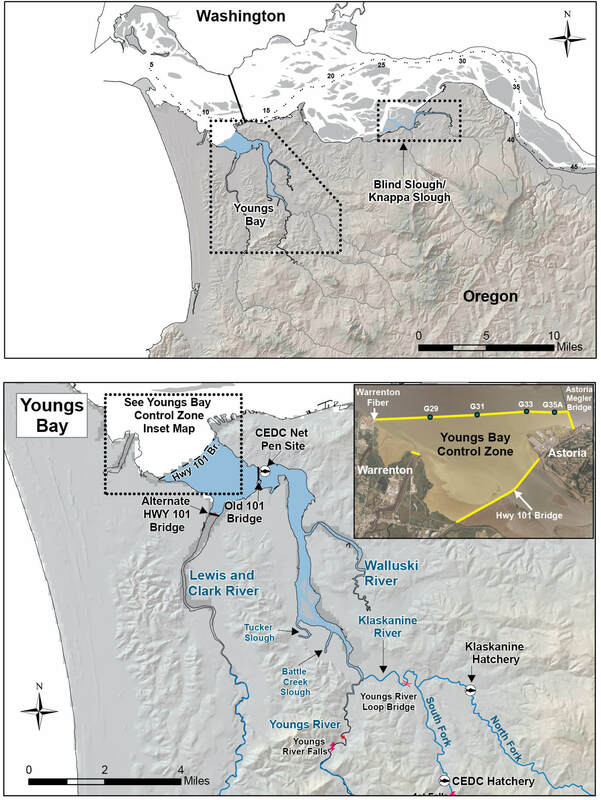 The boundary is a straight line across the mouths of the Willamette (including Multnomah Channel), Sandy and Hood rivers and the Hwy 101 Bridge on Youngs Bay. Oregon and Washington state waters are defined by the state line which lies within the waters of the Columbia River. In the area from the mouth upstream to Altoona, WA (Rivermile 24), the state line is near the Washington shore. In the area from Altoona, WA upstream to above McNary Dam (except near mainstem dams) the state line is in the middle of the ship channel. Mainstem Columbia River fisheries for salmon, steelhead and sturgeon are co-managed by the Oregon and Washington Departments of Fish and Wildlife and the four Treaty Tribes, represented by the Columbia River Inter-Tribal Fish Commission. Based on discussions among the co-management agencies, Oregon may adopt in-season changes to sport fishery regulations in the Columbia River. Regulation changes can occur on short notice and will be made available to ODFW field offices, the news media and license agents. Anglers can check the status of regulations prior to fishing the Columbia River by checking the ODFW website: myodfw.com for these rules, or calling 503-947-6000 during normal business hours. Anglers are restricted to one annual catch limit of white sturgeon in the Columbia River even if licensed in Oregon and Washington. When fishing on tributaries, sloughs or from the land of a state, the angler must be licensed by that state and obey all angling regulations of that state. For the mainstem Columbia River salmon and steelhead fishery upstream of the Rocky Point-Tongue Point line to McNary Dam from February 15 through June 15, it is unlawful when fishing from vessels which are less than 30 feet in length, substantiated by U.S. Coast Guard documentation or Marine Board registration, to totally remove from the water any salmon or steelhead required to be released. It shall be unlawful for any person to angle from a vessel while fish are onboard that are not allowed to be taken in the area being fished. This regulation does not apply to vessels in transit. Use of barbless hooks is required when angling for salmon, steelhead, sturgeon, or trout in the mainstem Columbia River from Buoy 10 upstream to the Oregon-Washington border located upstream of McNary Dam (RM 309.5). While sturgeon are very hardy, anglers should still treat them with care. ODFW encourages responsible catch-and-release fishing for sturgeon to ensure that these incredible fish are available for future generations to enjoy. Sturgeon greater than 54-inches in fork length must remain in the water at all times. When catch-and-release fishing, fish must be returned to the water immediately unharmed. Only single point, barbless hooks are allowed. Keep sturgeon in the water, regardless of size. Never lift or hold the fish by the gill plates. Non-offset circle hooks and short leaders can prevent deep-hooking. Attach your weight using a slider and line that is lighter than the main line, to ensure less gear will stay with the fish if you break off. Limit your fishing to times when the water temperature is less than 70⁰F. Limit your targeting of large, mature fish (over 6-feet). It takes 25 years for a sturgeon to reach this size and they are the future of the population. Take actions to release fish quickly. When fighting a large sturgeon from a boat, release from the anchor and follow the fish. Take photos as quickly as possible. Don’t try to photograph every fish — just take a few pictures to remember the trip. Trout 2 per day, 3 daily limits in possession. Only hatchery steelhead may be kept. Closed for sockeye and chum salmon. 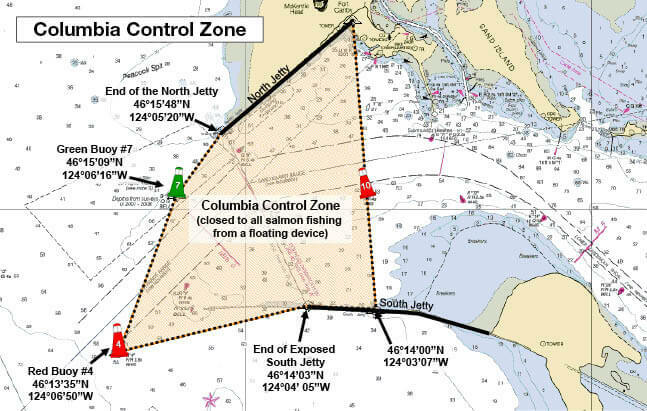 See Exceptions in Columbia River Zone to determine where harvest of any Chinook or coho salmon is allowed. Harvest of wild steelhead is not permitted in the Columbia River Zone. There is no annual limit on hatchery salmon or hatchery steelhead so long as the appropriate number of Hatchery Harvest Tags have been purchased to record the catch. 12 inch minimum size limit for jack salmon. Additional Chinook seasons are determined on an annual basis. Visit myodfw.com for more information and reglations updates before you fish. Sturgeon Catch-and-release only, except as noted under Exceptions. Closed to retention of green sturgeon. 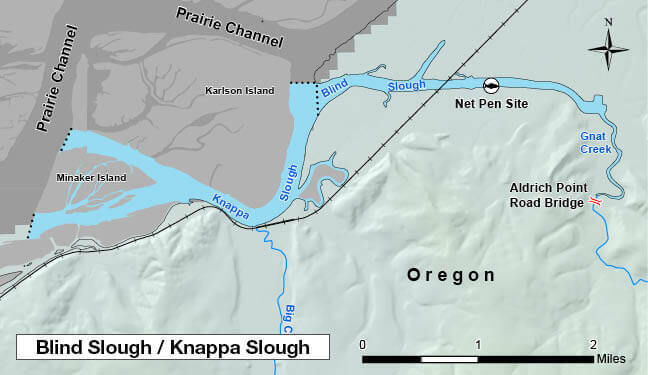 Closed to retention of white sturgeon below Bonneville Dam. Additional opportunity is determined on an annual basis, visit myodfw.com for more information. Catch-and-release: Open all year, except as noted under Exceptions. Note: Sturgeon fisheries are managed on a quota basis. Check the status of regulations prior to fishing. Largemouth and Smallmouth Bass,Striped Bass,Bluegill, Catfish, Crappie, other Sunfish, Walleye,Yellow Perch,Northern Pikeminnow, Carp, Sucker, Chub, Sculpin, Whitefish and other Nongame Fish. No limit. None. Open all year. Shad No limit. Shad angling closed from Buoy 10 line upstream to Bonneville Dam Apr 1 – May 15. Open all year except as listed under Other Specifications.